Who can Benefit from Power Lift Chairs? Power lift chairs can help return mobility and independence to individuals with limited mobility, especially those who have increased difficulty getting up from and sitting down in chairs. A power lift chair is similar to the traditional reclining chair, but with a built in motor to allow for adjustments to the chair itself. Featuring single or dual motors, power lift chairs allow the user to adjust the seat to a nearly upright position to aid in movement. Being able to sit and stand without the aid of others can be key to preserving individual freedom and independent living, especially later in life. Power lift chairs come in a wide range of styles and builds, and feature a variety of custom upholstery options. It can be overwhelming to search through all the different options out there for power lift chairs, which is why we’ve gone through the trouble of finding the top picks for you. Click the buttons above for detailed information about each unit, or read on to find out which power lift chair option is the best choice for you, and why. Our top pick for power lift chairs is the U-MAX Massage Chair Power Lift Recliner. 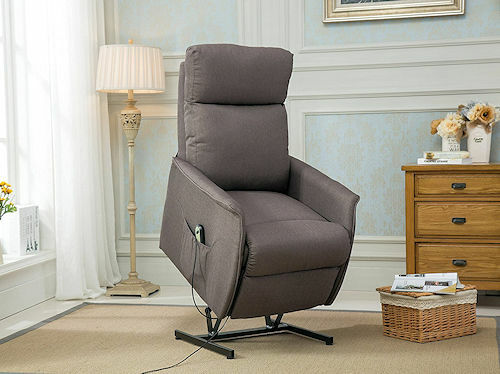 With two individual remote options for increased precision when entering and exiting the chair, as well as massage options with five different speeds on four target areas, the U-MAX Massage Chair Power Lift Recliner takes functionality and comfort to a new level at an affordable price. With the additional benefit of only 10 inches of clearance required to incline, and wheels attached to the base of the chair for easy installation and movement, the U-MAX functions smoothly and cleanly, without sticking out like a sore thumb in your living area. 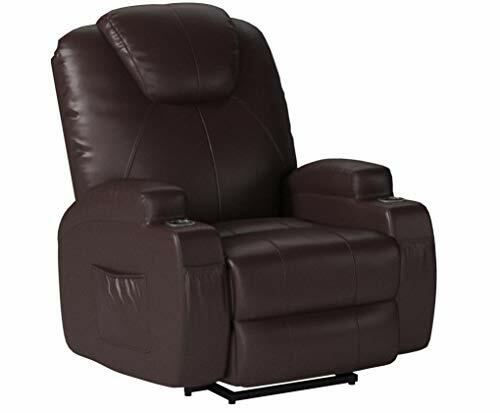 The U-MAX Massage Chair Power Lift Recliner features PU leather upholstery and extra thick sponge head and backrest features, so you don’t have to trade your comfort for the convenience of mobility. On top of the wonderful comfort features, the U-MAX offers free shipping and additional insurance packages, and has over twenty five-star reviews on Amazon. While this model is a bit more pricey than the other two options, you gain the additional massage and comfort features of the U-MAX, which is why it made its way into our top spot for power lift chairs. 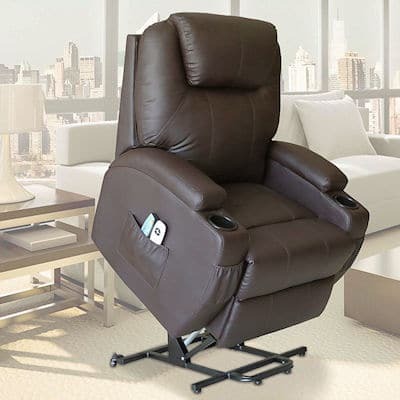 Reclining comfortably in the number two spot for power lift chair options is the Coaster Home Furnishings Modern Transitional Power Lift Recliner Chair. 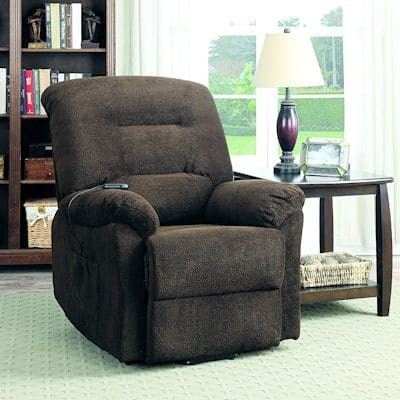 This model features textured chenille upholstery for comfort and style, as well as a single remote controlled lift system with attached cord so that an individual or their caretaker can easily use the lift features without having to worry about losing the remote. The Coaster Home Furnishings model also includes a backup battery, so in the case of a power failure you or your loved one are not left without a functioning lift. 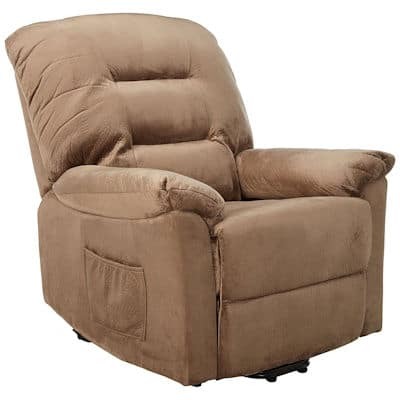 The Coaster Home Furnishings Modern Transitional Power Lift Recliner Chair makes it into the number two spot for us for the pricing level and the safety features included. Though not as fancy as the U-MAX model, the Coaster Home Furnishings power lift offers the added protection of a backup battery, as well as relining features for additional comfort and a five year mechanism warranty for the reclining system all for a very reasonable price, meaning its the perfect power lift chair for your budget. Even though its resting in the number two option, this power lift chair is still a winner in our books. And with all the amazing features included, you don’t have to trade functionality for frugality. The third place option is another Coaster Home Furnishings Power Lift option, this time featuring a padded velvet upholstery option and both cream and chocolate color options. Coming in around the same price point as the first Coaster Home Furnishings lift featured in spot two, this lift boasts both lifting and reclining options controlled by an easy to access single remote that has a lengthened cord to allow for use by caretakers and individuals seeking higher levels of mobility alike. While this model does offer the capability for a backup battery, the battery itself is not included in the purchase itself, which puts the product a bit higher on the price point than the other options. Along with this, this model doesn’t rank as highly as the other two on the customer review metric, though that does not mean that this lift is by any ranking a failure. Based upon a number of 4 or 5 star reviews, this lift is a good starting metric for anyone looking to invest in a comfortable power lift chair that doesn’t break the bank and doesn’t need any of the over the top features for their recliner. With a built in remote pocket for ease of access, and free shipping, this chair may be at the number three spot but its still lifted its way into the top picks for power lift chairs, and is a wonderful choice for someone looking for a more basic but still comfortable and functional option. Power lift chairs are very useful for individuals who have limited mobility, such as elderly individuals, who are looking to maintain their own autonomy without having to sacrifice their comfort. 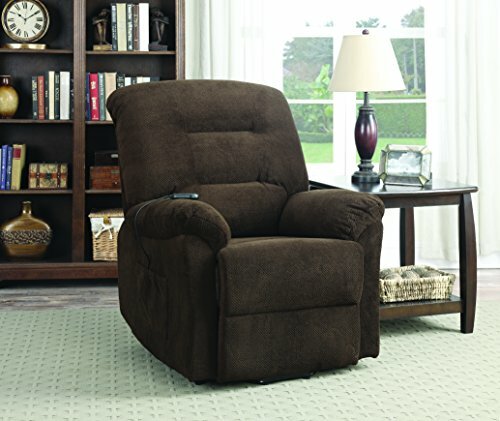 Unlike the recliners for sleeping, which are designed primarily for comfort, power lift chairs help individuals who have limited or restricted mobility, especially in the case of sitting down and standing up from various angles, be able to exit and enter their seating arrangements without the aid of another person. This can help restore independence and comfort to an individual, and allow them to reside in the comfort of their own home safely. The required lift range and functionality of power lift chairs are two important features to keep in mind when looking at power lift chairs. Most power lift chairs require a 10-20 ft distance from any wall or surface to allow them to operate smoothly. Checking to see the power requirements and backup options for any power lift chair you are thinking of investing in is also important. And, of course, looking at the quality and appearance of the upholstery is also key to making sure your new chair matches your living space and provides the best comfort possible for you or your loved one. Researching shipping and installation options is also important, as the delivery and placement of your power lift chair can be difficult if you live in an enclosed space or on the second or third story of a building. Keep in mind the dimensions of each power lit chair when trying to decide on the right one for your living situation.